Lacrosse, in all forms, is such an important part of the native culture. It not only allows players to entertain and honour the creator, it also brings communities together and generate so many opportunities for aboriginal athletes who excel in the game. As a female who plays, I have noticed and have heard about conflicts when it comes to allowing women and girls to play the game. Lacrosse was originally created for the men of the tribes, since they were the ones who went to war, but instead of shooting guns and dodging bullets, they would use the game of lacrosse to battle out their conflicts. I respect the beliefs of the traditional individuals who don’t think women should play. That’s how the tradition has always been, and having women play is a big change. But I love the fact that women are getting out there and helping grow the game. 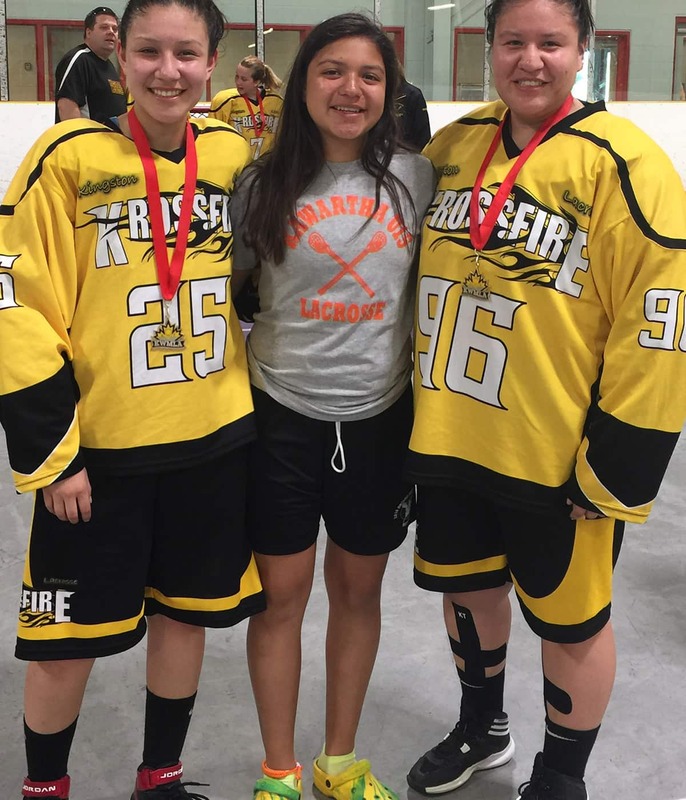 This is first year that women’s box lacrosse will be played at the North American Indigenous Games in Toronto. I’m so proud to be a part of it, and entertaining the creator at the same time. Jordan and I practised intensely just working on the basics. I bet if you asked him today, he would say all of my success was due to his help. I’ll give him some credit, and I’ll take some for my own hard work, but I give the majority of the credit to my dad, Victor Tabobandung. Since Day 1 my dad has always encouraged me to do my best. If I wanted the best, then I had to work hard to get it. That’s one of the biggest lessons that I have absorbed and learned to apply to different aspects of my life. I will continue to use it when I start at Queen’s University in the fall. I have mentioned both of my parents, and a good friend that inspired me to start playing, but when it comes to NAIG, I have to give all the credit to my younger sister, Kendall. She attended the first tryouts and came home beaming because she loved it so much. She then continued to convince me to try out. If it wasn’t for her, I wouldn’t have met my determined, wonderful teammates, and I certainly would not have had the chance to write this essay about my story. What makes the NAIG Games so special is that we are all aboriginal athletes. It helps the players showcase their talents. Whether it’s an individual sport, or a team competition, athletes get a chance to be seen competing. The Games are also important because they help break through the negative views and stereotypes of our youth. The Games prove that our First Nations youth are capable of far more than being subjected to substance abuse and mischief. The athletes at NAIG are working proof that there are bigger and better opportunities inside and outside of their familiar territories. The players just have to be determined to succeed in order to get there. Adding female box lacrosse to the event will hopefully reel in a whole new generation of young female viewers, who will get the chance to become inspired by our team and want to join the lacrosse family as well. Being part of any team allows an individual to feel welcome. It helps them work on social and leadership skills. They get a chance to become something great. My personal goal for NAIG is to show people that women are also capable of entertaining, that we can be as aggressive as the boys and that we can really bring the thunder. We don’t have to have the huge muscles and big hits. But we make the game interesting our own way. A lot of the girls are swift on their feet and have some of the hardest shots I have ever seen. I want to prove that girls can bring the hammer down too. Being the first women’s team, our hope is that more young females will realize that lacrosse just isn’t a “boy’s sport” anymore, that it is growing for females and it is growing fast. I’ll let my sister Kendall, one of the youngest players, have the last word.